Online enrolment of beneficiaries in a paperless environment. Exclusive HR login to raise and track claims on behalf of your employees. Faster settlement of employee claims based on online submission of documents. Dashboards that give you a graphical summary and detailed reports of parameters like claims settled, outstanding pre-authorizations, enrolment details, claims dump and more. Business analytics that allow you to track your portfolio utilization and profitability. A unique portal for hospitals to eliminate common bottlenecks associated with pre-authorization and claims settlements. Online enrolment of beneficiaries, planned cashless hospitalization, 1. Preferred discounted tariffs 2. VIP tagging 3. Online submission of claims 4. Real-time claims tracking – we offer a range of services that make health benefits administration truly hassle-free. Regular information about portfolio performance, claims analysis, and much more from a dedicated relationship team. Apart from a unique login for the HR team, our online portal also offers a range of MIS reports that give you deep insights into your health benefits portfolio. Your personalized e-gateway to MedSave services. Log in with your secure credentials anywhere, any time. The portal allows you to generate your e-card, submit reimbursement requests online, and also scan and upload your medical records to maintain your electronic health repository. Carry your world of health insurance with you on your smartphone. 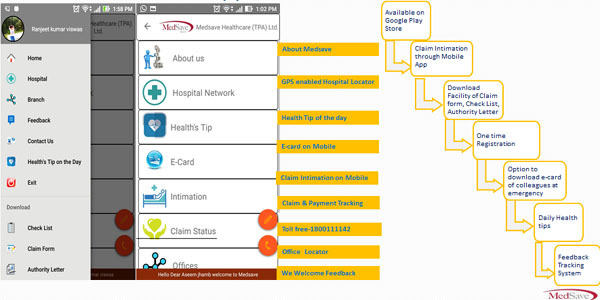 The MedSave app allows you to send claims intimation, track claim status in real-time, view your e-card and also access your claims history / medical records in digital format on the move. We strive to provide you with our customized personal services and assure you of the best services in all times. Click below To Download MedSave app Now!